I realised that I never provided any nice "finished" pictures of my quilt. It was finished last Christmas in the midst of the uproar of moving overseas. 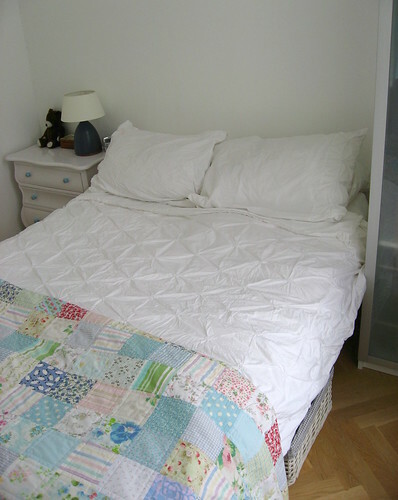 Our flat in Amsterdam doesn't have a laundry line, which was always my favourite place to take full-size pictures of quilts, so the folded and on-the-bed versions will have to do. It's been in regular usage and I love it so much, that, well, as predicted, it's just not going to end up on the ground in the park for picnics. Also, a double-bed size quilt seems too bulky for carrying to picnics. 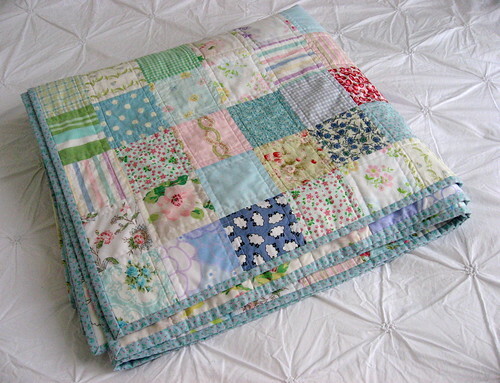 Maybe my next quilt will be smaller and destined for picnics. But first I must find myself a sewing machine over here! I miss it so much for little fixes to grandiose new project ideas.